Maryam from Pamplemousse1983 here! Happy Monday! Ok, maybe not so happy but today's list might get your mind off the fact that it's the first day of the workweek for most people. If you're like me, you are constantly planning your next vacation. Thinking about where you'd like to go, what you would like to see, where you'd like to stay, etc. I tried to focus my list on places I haven't been before but with a couple of exceptions, the first being Hawaii which I'm not sure I should count because the one time I was there (other than being in the airport) we were only in Honolulu and all I remember was going to McDonald's...I was very young at the time. I think we were there for like a day or two. The other exception is Haifa, Israel. I think I've been there maybe 5 times total? I even lived there for about 3 months until the Lebanese war broke out. It's a holy place for my religion and the hubs and I are planning to go for pilgrimage next spring. I'm super excited about it as he's never been! Plus, we'll be travelling with our first child who will be about 10 months then, so that should definitely be an adventure. On the way we'll stop in Belgium to visit my dad's side of the family and if all works out my parents will also meet us out there. Needless to say we're already saving up for this trip. Now I want to know what's your next trip? Or fantasy trip? Where does your little heart desire to visit? Thank you SO much Maryam for being our sponsor this month! We were so luck to have you! Your list is too fun!!! Gotta love traveling! I just got back from traveling with my three young children, and I hate to say it, but I never want to leave home again. We will wait until the kids are all grown, and then I we will go on a long trip to Hawaii. My husband and I are taking a two-month road trip this summer, and I've already started making lists for it! - What campsites will we visit? - What clothes will we need? - What music should we listen to? - What yummy camping meals can we make? 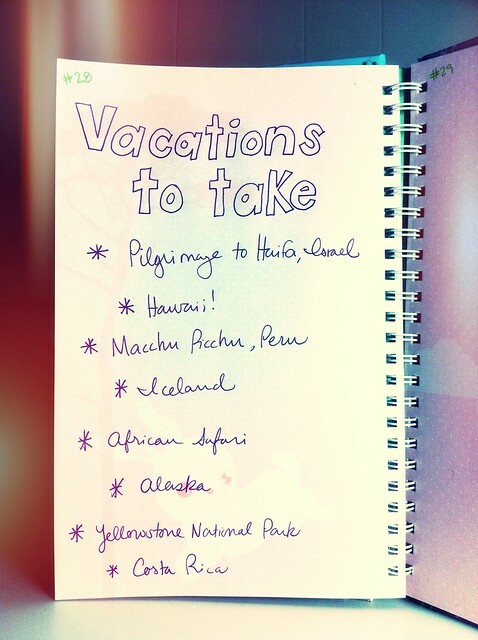 I find that making lists for a vacation just make me 100 times more excited about the trip! I reaaaalllyy want to get myself to Cuba before Castro bites the dust - in fear that it might all change then. Cambodia is another place I am eager to visit but luckily enough I have this summer for that! !